"If you believe in God, then intellectually you cannot believe in man-made global warming. You must be agnostic or atheistic to believe that man controls something he can't create. It’s always been one of the reasons for my anti man-made global warming stance." The purpose of this blog post is not to generate arguments over global warming. 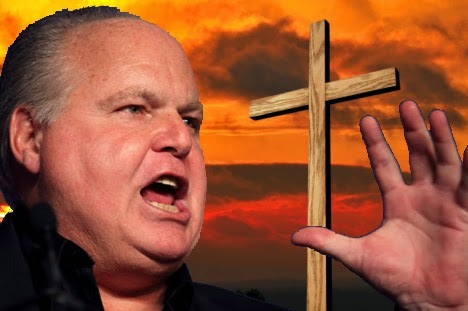 I merely offer the Limbaugh quote as an example of how a religious belief can drive irresponsible and dangerous attitudes which could have far-reaching implications for the planet. With this faith-based claim, he sweeps aside any present or future scientific findings. His presuppositional beliefs in God and creationism dictate that he reject any scientific evidence to the contrary. He thinks that his god created the planet and therefore, nothing we can do as human beings could significantly damage it. But hey, it's just a belief, what's the harm - right? If Rush’s ‘talent’ is on loan from God, then his god must be quite poor in the reasoning skills department. Does Rush not think that nuclear bombs could have an impact on our planet? That we can endlessly pollute and not endanger the conditions of the world in which our descendants will live? Rush’s god is imaginary, but the influence this god wields over his mind, and the minds of his many followers poses a very real danger.